Primanti Bros. is a Pittsburgh staple for their sandwiches loaded with french fries and coleslaw. Now, even Pittsburgh suburbs and select Florida locations can indulge on these mouthwatering meals within the trip into the city. In the surburban locations, there is an emphasis on the sports experience. During most any game, there is a beer special and the opportunity to get “big slice pizza” for only$ 1.50 a slice. The pizza slices may not consistent in their presentation, but the taste is something to count on. 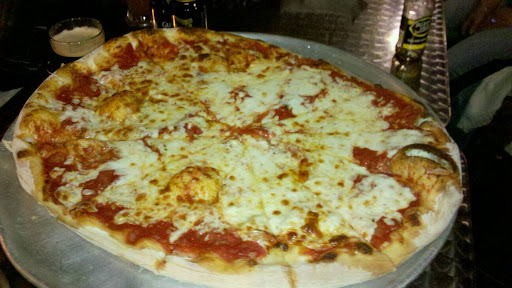 The pizza dough is thin in the base with a bubbly crust. Sauce tends to be chunkier than most pizzas, but it is the reason I usually don’t add toppings. You can see from the picture that they don’t over cheese the pizzas, so if you like cheese, order extra!